What would a marketer’s world look like without marketing automation? The short answer is that you don’t want to know. The longer answer is that you really don’t want to know. For those who are still doing things the hard way, we’re defining automation and its advantages right here. Automation is, at its heart, anything that makes a marketer’s life easier by removing manual work. If you’re using software like HubSpot’s free marketing subscription to collect form submissions and get them into a database, you’re using marketing automation. If you’re setting up rules that allow you to segment a database into audiences for your marketing campaigns, you’re using automation. Oh, and are you setting up nurture tracks to automatically email prospects when they take an action? Surprise! You’re using marketing automation again. When we talk about automation, what we’re talking about are capabilities that arose in the last 20 or so years, thanks to the advent of new technology. Back in the dark ages of marketing, if you wanted to get a message to a prospect, you had to bridle up your horses, pack your wagon with laudanum and salted pork, and strike out into uncharted lands to let them know that FrontierTech is the only water wheel solution your farmstead needs. Now, we can take care of most tasks with a combination of knowledge and the push of a button, which is easier and only slightly less adventurous. You may need a refresher on all these marketing terms we’re throwing around. If so, check out our inbound marketing definitions page where you can learn anything you want to know about inbound. Seriously! If there’s something missing, you can ask for us to define it and we will. As we mentioned above, inbound marketing should be a combination of art and science. That makes it difficult to A) quantify your impact as a marketer and B) figure out exactly what the most effective method is for reaching your audience. The ability to automate has added a little science to the mix, effectively standardizing some of the best practices for marketers and making those best practices easier to execute on. 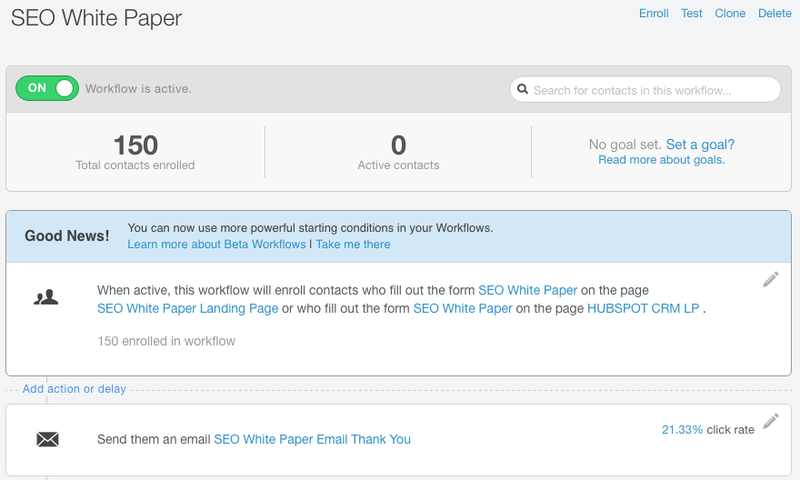 For example, HubSpot allows you to easily set up email workflows. We have set up a workflow below that targets contacts who have filled out a particular form to download an SEO-focused white paper. Using marketing automation, we’ve ensured they’ll get a thank-you email for doing so. If we wanted to, we could easily build out more steps. We might want to keep those same users abreast of any new content offers we’re cooking up here at Raka. Or we might set up rules to weed out prospects who show little interest in what we’re offering (sad face). This kind of automation eliminates the tedious (and mistake-filled) work of emailing prospects on an individual basis. It also frees you up to spend more time on the things you love doing, like content creation, strategizing, and sending hilarious GIFs to your co-workers. Remember: A is for Automation, and also awesome, an adjective that applies to automation. If you’re short on time but simply have to understand this term, here’s the gist: Marketing Automation is technology aimed at removing the manual work from repetitive tasks and data collection in marketing contexts, making you a more efficient marketer. It’s a great thing, and you should be using it. The end.